I received my new Sound Anchor subwoofer stand this afternoon, all 70+ pounds of it. It was packed well, bolted to a plywood base in a heavy cardboard shipping box. After unpacking the stand, I installed the four spikes on the bottom of the stand, placed it where my Fathom had been sitting, and proceeded to wrestle the Fathom up and onto the stand. The Fathom f113 is an awkward monster when trying to move it by yourself. I managed to get it on the stand without any damage to the finish, but it was not easy. (Advil tonight). After reconnecting the left and right line inputs and power cable, plus a thorough cleaning of hand prints on the subwoofer, and a wipe down of the stand to remove dust, I was now ready for an audition. First up, Brian Bromberg, "Never Give Up". Brian's electric bass on this track is a nice test of bass tone, attack, and extension. My immediate impression of the Fathom being elevated seven inches above the carpet was a new sense of depth and width from the lowest octaves in the sound stage, a more three dimensional image to the bass. My second impression was the volume level of the bass from the Fathom was lower in the new elevated position than at floor level. This was quickly resolved with a slight increase of the Fathom's Master Level control. The Sound Anchor subwoofer stand has made a very nice improvement in the dimensional quality of the lowest octaves, and for this alone it is worth the price. The quality of construction of the Sound Anchor subwoofer stand is impressive. Every piece has been accurately measured, cut and welded with a high degree of mechanical craftsmanship. The fit and finish is impressive, and the solidity of the finished product is in the Sherman Tank category. No light weight materials were employed in this design. Do not, I repeat, do not stub your toe on this stand. Your toe will lose! A vacuum cleaner will be no match for this serious subwoofer stand, either. The stand is actually larger than I had anticipated in its front to back measurements. The manner in which the front and rear crossbars were attached leaves these steel members jutting forward and rearward past the actual front to rear dimensions of the subwoofer. This certainly creates a solid foundation, but will take some time for my eyes to adjust to the visual impression. One thing I like about the spikes is they pierce the carpet and embed themselves in the sub-floor creating a vibration free stand. A plus is the spikes keep the stand just at the carpet pile height so no deep carpet impressions will form from its placement. I can recommend the Sound Anchor subwoofer stand. Ivan and Robert have managed to design and produce an attractive, and highly functional subwoofer stand that compliments the visual beauty of the Fathom subwoofers, and improves the three dimensional quality of the lowest octaves in the sound stage. In my opinion, this stand is a winner for anyone with a JL Audio Fathom subwoofer. Is it sold in Europe? Yes, I ship these Worldwide. You will however first need to become a Subscriber, so we can communicate. Although not involving a speaker system, when replacing my ceiling mounted Epson 6010 projector with a new Sony 4K UHD laser illuminated projector, I decided to mount the projector on a floor mounted platform rather than the ceiling because the "animals" in my house walk like elephants with very heavy feet and, at times, cause the projected image to shake in the home theater in the basement. Rather than choose a table or some other appliance on which to place the projector, I contacted Sound Anchor and together we designed and am having built a bespoke three-legged platform that is 50" high and with a top plate of about 19" x 22" to support the projector and with a similar footprint for the base at the bottom. It is looking a lot like one of their speaker stands just taller and, obviously, bigger. Two of the three legs will be be appropriately filled with whatever it is that the fill the legs with (a sand and polymer concoction I believe) and the third leg will be empty to provide for cable routing. Although it probably won't affect anything in the audio spectrum, I fully expect stability of the light energy in the visible spectrum, and my viewing pleasure, to be immeasurably enhanced. Sound Anchor folks are good guys indeed! Front: B&W N801s, Centre: B&W Signature HTM, Surround: B&W 801s3, Surround Rear: B&W HTM2, Sub: JL Fathom 212. MC-1201s, Bryston 4BSST and 6B SST, MX-150 pre/pro, Lumin S1 Network Player w/JRiver and JRemote, OPPO BDP-95, Toshiba HD-XA2HD-DVD, Epson 6010 and 120" Da Lite Joe Kane Affinity, Lumagen 2143 Processor, QNAP TS-879 PRO NAS, Cardas Clear XLR/Cardas Clear Beyond Speaker, Wire World Gold Eclipse 7. 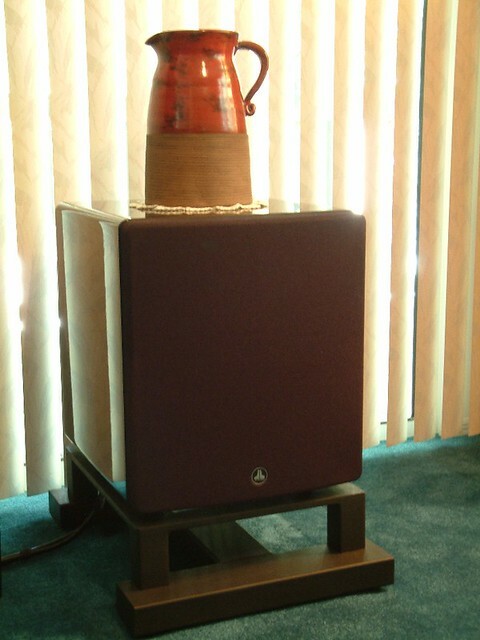 Hard to believe it's been eight years since I placed my JL Audio Fathom f113 subwoofer on the Sound Anchor stand. It's still sitting right there. Dan... tell me about it! I never pulled my stands out of the box. One of these days!